Raunaq Rajani: A pure bred Bombay boy, Raunaq Rajani has been in the comedy scene for a little more than half a decade. . He has appeared on Cyrus Broacha’s: The Week That Wasn’t and Rising stars of comedy on NDTV prime. 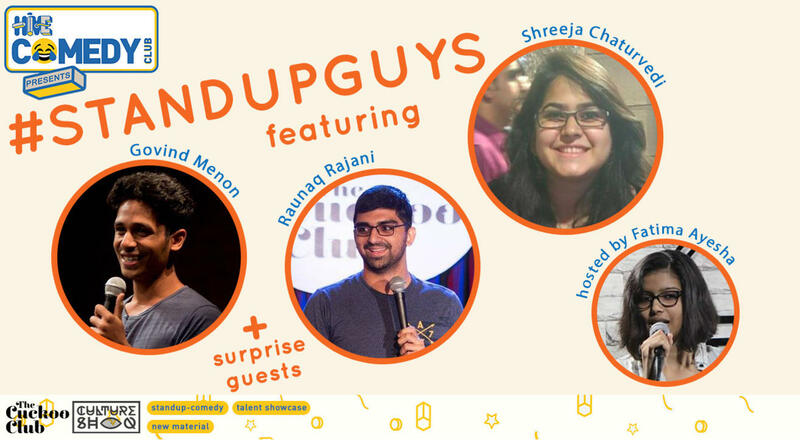 Some insightful perspective, honest observations and sarcastic wit make Raunaq an act that you shoudn't miss! Govind Menon: Govind Menon, like most Stand up artists, had a troubled childhood. Growing up in the mean streets of Mumbai, the only thing he had going for him is his curly hair. Having recently hit puberty, not much has changed except that, instead of his diary, Menon now uses a mic to document the ridiculous events that make up his life. Some of these events also happen to be funny..
Fatima Ayesha: A teacher by profession, Fatima ironically talks about how pointless education is. A dedicated Crime Patrol fan, Fatima lives in the fear of being killed by her students one day. Coming from the faraway land of Kalwa, Fatimashamelessly uses the hashtag travelgram for local train pictures. She is half Muslim, half Hindu, and totally racist. Come watch her 'bomb' on stage.